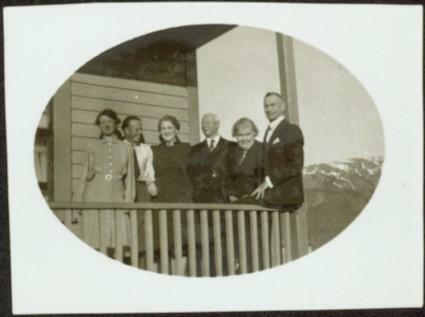 Group of six men and women stand behind railing of veranda at unknown building. Sarah stands third from left, Bert sits on railings on right. Mountains visible in background. Image cropped to oval shape. Similar group also featured in items 2009.5.2.274 - 2009.5.2.294. Item is part of the Taylor-Baxter Family Photograph Collection. See also item 2009.5.2.287 for image featuring same location.